Published: Feb. 7, 2014 at 05:55 p.m. 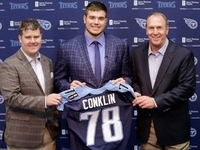 Updated: May 7, 2014 at 07:41 p.m.
College Football 24/7 takes a look at the buzz surrounding the AFC East teams leading up to the 2014 NFL Draft. The Bills are riding the NFL's longest-running playoff drought -- having gone 14 seasons without a postseason appearance -- and own another top-10 draft pick. A top-flight tight end for last year's top pick EJ Manuel to throw to would be an option, as could adding more pieces to a promising defense. The Bills and Ravens showed Mosley the most interest in his pre-draft visits and workouts, the Alabama linebacker said. Buffalo figures to be in a far better position to draft Mosley than Baltimore, and not simply because they pick higher in the first round. Kouandjio (6-foot-7, 324 pounds) once was considered a likely first-round selection, but medical issues reportedly are more than a bit bothersome for some teams. While teams seemingly differ on his draftability, they can't differ on his size: Kouandjio is absolutely massive -- he looks bigger than his listed size, if that is possible -- and he road-grades people as a run blocker. His pass protection is a question, which likely means he fits best as a right tackle after he played left tackle for the Tide. Interestingly, Buffalo needs a right tackle, and you wonder if the Bills would snap up Kouandjio if he is available when they pick ninth in the second round (41st overall). West (5-foot-9, 224 pounds) looks to be moving up on draft boards and could go as early as the third round. He set FCS single-season records for rushing yards (2,509) and total touchdowns (42) in 2013. He lacks elite speed, but he ran the 40-yard dash at February's NFL Scouting Combine in 4.54 seconds and has patience and good vision. He has quick feet and is a tough, powerful downhill runner who is at home working between the tackles. He was a workhorse at Towson, averaging 260 carries per season in his three-year college career (he averaged 26.1 carries per game in 2013). Buffalo seems intent on adding a running back to a group that includes C.J. Spiller and are intrigued by West's power-running ability. The Bills pick ninth in the third round (73rd overall selection) and also ninth in the fourth round (109th overall). Martin (6-foot-3, 320 pounds) and Colorado State's Weston Richburg are the two best centers in the draft. Martin started at guard in his first two seasons with the Trojans, then moved to center as a junior in 2013. Center wouldn't appear to be a high priority for Buffalo, which already has former first-rounder Eric Wood, 28. But Martin could start at guard until Wood is ready to be replaced; then again, Buffalo could think Martin is best-suited for guard. Buffalo picks ninth in the second round (41st overall), then picks ninth again in the third round (73rd overall). But Martin likely would be gone by the 73rd pick. Evans met with the Bills, but whether or not the receiver will be available at No. 9 likely would be a concern for the team. The Bills need to add some receiving weapons for second-year quarterback EJ Manuel. Fuller (6-foot-0, 190 pounds) is one of the five best corners in this draft (along with Darqueze Dennard, Justin Gilbert, Bradley Roby and Jason Verrett), and he is both physical and fast. Could the Bills be interested at No. 9? That seems a bit early for Fuller; plus, corner doesn't seem like a first-round need for Buffalo. It seems likely that five corners are going in the first round, and the first one coming off the board could spark a run of sorts at the position. A selection in the late teens or early- to mid-20s is in line with where Fuller is expected to go. Buffalo entertained two draft prospects Wednesday: Texas A&M OT Jake Matthews and Brown. Matthews is considered a top-10 lock; Brown (6-foot-1, 251 pounds) is seen as a third-day pick. Brown is solid against the run but struggles in coverage. Buffalo signed Brandon Spikes in free agency to be its starting middle linebacker, but Brown could be a special-teams guy and the backup in the middle. The Buffalo News said Matthews would be in town for the meeting with Bills representatives. The Bills pick ninth in the first round, and it seems doubtful Matthews will be available. Cordy Glenn starts at left tackle for Buffalo, while Erik Pears started on the right side in 2013. There is a deep pool of wide receivers in this year's draft, and Latimer appears to be one of the fastest-rising prospects at the position. NFL Media senior analyst Gil Brandt said Latimer already has met with Buffalo, is visited with Philadelphia and has meetings set up with Carolina, Detroit, Oakland, Seattle and San Diego. Ebron has an April dance card filled with private workouts and visits with various NFL clubs. But while teams are more serious about drafting some of their prospect guests more than others, Ebron's trip to Buffalo figured to be all business. Ebron visited the Bills along with LSU running back Jeremy Hill and Oregon State defensive end Scott Crichton. The Bills could be looking for some young depth at corner, having just signed Corey Graham away from Baltimore, and Clemson's Bashaud Breeland and Duke's Ross Cockrell could be interesting additions. Both Breeland (5-foot-11, 197 pounds) and Cockrell (6-0, 191) have good size. Breeland is considered the better prospect of the two, despite running a 4.62 40 at the combine, and he has the potential to develop into a starting corner; Cockrell seems more likely to become a No. 3 or 4 corner. Breeland looks to be a second-day pick, while Cockrell should go on the third day. Ohio State cornerback Bradley Roby and linebacker Ryan Shazier, and Baylor running back Lache Seastrunk visited with the Bills. This came a day after Indiana wide receiver Cody Latimer and Notre Dame tight end Troy Niklas also visited with the team. Watkins was on NFL Network's "Path to the Draft" and admitted that his favorite team growing up was the Bills. 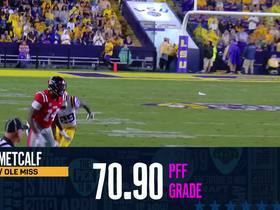 Wide receiver is among the Bills' top draft needs, according to NFL Media analyst Daniel Jeremiah, who writes, "If Sammy Watkins would somehow fall to No. 9, it would be difficult for Buffalo to pass." Running back isn't the Bills' most pressing need, but adding depth to the position appears to be in the offing in Buffalo. At the NFL Scouting Combine, the first team to interview Williams -- who rushed for a FBS-leading 2,177 yards in 2013 -- was the Bills. The Dolphins endured some drama along their offensive line in 2013, and figure to be looking to rebuild that area this offseason. The team also figures to be on the lookout for another running back. The Dolphins are stuck in limbo with the No. 19 overall pick in the first round of the 2014 NFL Draft. With the players Miami covets likely to be off the board by the time they are on the clock in the first round, general manager Dennis Hickey is trying to trade out of the 19th spot, reports the Miami Herald's Armando Salguero. Miami's linebacker play last season can charitably be called mediocre, and the Dolphins could turn to a "local" prospect to help shore up the position. Shazier -- who grew up in the Fort Lauderdale suburb of Plantation, about 20 minutes north of Sun Life Stadium -- met with Dolphins officials for about 90 minutes, the Miami Herald reported. Shazier's father, Vernon, is the Dolphins' team chaplain. Brown is seen as a third-day pick. Brown is a thumper against the run but struggles in coverage. The Dolphins' linebackers underachieved last season, and Brown would give Miami a physical presence in the middle. He doesn't seem to be a three-down linebacker, though, because of his issues in coverage. Miami has middle-of-the-round picks in the fourth and fifth rounds, and that is roughly commensurate with Brown's perceived value. The Palm Beach Post reported that Dolphins LB Koa Misi wasn't happy with a proposed move to middle linebacker, making it more likely the Dolphins try to get a middle 'backer in this draft. Miami owns the 19th pick, needs to upgrade its line and has been to tied Martin, who might be the most versatile offensive lineman in the draft. But NFL Media draft analyst Mike Mayock said "there's no way in the world he gets close to 19" on a teleconference Thursday. Mayock said he can see each of his top four tackles being gone by pick 19 and that Alabama OT Cyrus Kouandjio was the next tackle on his list. But taking Kouandjio is a reach, and Mayock said "a wide receiver would pique my interest" at No. 19, mentioning LSU's Odell Beckham and Oregon State's Brandin Cooks as possibilities for the Dolphins at that position. The Dolphins brought in Herron for a pre-draft workout very late in the process. Herron is effective on wide receiver screens and also has the ability to play in the slot. Herron emerged as a playmaker as a senior, when he had nine TD catches. He would seem to be a third- or fourth-round selection in a deep draft for receivers. While Herron isn't going to be a No. 1 receiver in the NFL, he could become a solid complementary guy. It wouldn't be a surprise is the Dolphins took two receivers in this draft. Everybody knows the Dolphins' offensive line needs work, and Long (6-foot-5, 320) could be a third-day pick. Long suffered an injury to his left knee in mid-October and missed the rest of the season; a healthy Long would've vied for first-team all-league honors. A former walk-on, Long is a road-grader in the running game and showed gradual improvement as a pass blocker. He has the potential to eventually become an NFL starter. Lyn's draft grade is a long way from being complete, given that he wasn't invited to the NFL Scouting Combine, and that a fractured knee cap would have prevented him from doing much there, anyway. He may not be drafted at all. But Lyn isn't totally off the NFL radar as he has visited the Oakland Raiders, Miami Dolphins and Detroit Lions, according to Syracuse.com. He'll hold a personal pro day Monday. And you have to like the photo he tweeted from Raiders headquarters. At first glance, Beckham (5-foot-10, 198 pounds) meeting with the Dolphins might seem a little bizarre; after all, Miami has Brian Hartline and Mike Wallace at receiver and would seem to have a far greater need along the offensive line and at cornerback than at wide receiver. But if the Dolphins aren't sold on Wallace, who was signed to a big-money free-agent contract last year, a receiver such as Beckham would make sense. Still, this is a draft that is loaded with wide receivers, so why go for one in the first round when you look to have bigger needs? Morris (6-foot-2, 213 pounds) played his high school and college ball in Miami; will he get to remain in his hometown in the NFL? Morris had a disappointing senior season and might not even be drafted. Still, he played in a pro-style attack at UM, has one of the strongest arms in the draft and is an interesting developmental prospect. Miami has Matt Moore and Pat Devlin backing up starting QB Ryan Tannehill, and team officials could figure Morris' upside is worth a late pick or a priority free-agent signing. Lee is expected to visit with the Dolphins on Tuesday, according to an ESPN.com report. Wide receiver would not seem to be a first-round priority for Miami -- especially in a draft this deep at the position -- but adding Lee (6-foot-0, 192 pounds) to a receiving crew that includes Mike Wallace and Brian Hartline would certainly give the Dolphins' offense a lift and appeal to QB Ryan Tannehill. Still, an offensive lineman would probably make more sense in the first round. Miami signed free-agent RB Knowshon Moreno but still worked out Mason (5-foot-8 1/2, 207 pounds) and Wisconsin's James White (5-9, 204); both attended high school in south Florida. Mason handled a heavy workload last season at Auburn and is one of the top backs in the draft even if his receiving ability and blocking skills are a question. While White isn't as fast as Mason, he can catch and block. Mason is a second-day pick, and White seems to be a third-day selection. Unless Miami is convinced that RBs Lamar Miller and Daniel Thomas can't help, using an early-round pick on Mason would seem to be a bizarre choice. White, on the other hand, would be an interesting selection on the third day. Miami certainly has bigger position needs than wide receiver, but Bryant has an intriguing size/speed mix (he ran a 4.42 40-yard dash at the combine -- faster than celebrated teammate Sammy Watkins' 4.43). Bryant likely will be available when the Dolphins pick in the second round. But his college production never came close to matching his potential, and "safer" receiver picks could be had in the second round and on the third day of the draft. Miami also is expected to meet this week with Florida State running back Devonta Freeman. Freeman is a solid all-around back who can catch as well as run between the tackles and also turn the corner. The recent acquisition of Knowshon Moreno has made drafting a running back a lower priority for the Dolphins. The Dolphins need offensive line help and they reportedly "would be happy" if Lewan falls to them at No. 19. The Miami Herald reported that "an associate of Lewan said he is aware of Miami's interest." The Herald reported that the Dolphins also like Michael Schofield, who was Michigan's starting right tackle the past two seasons. Wynn had a visit with the Dolphins, NFL Media senior analyst Gil Brandt reported. Wynn appears like a late-round draft choice possibility, where the Dolphins could be looking to add some depth to their roster. Dolphins running back coach Jeff Nixon conducted a private workout with West, the Miami Herald reported. Despite possessing Lamar Miller and the addition of Knowshon Moreno, the Dolphins appear to be on the lookout for another running back to add via the draft. Sam, the NFL's first openly gay draft prospect, was at complete ease answering questions from a massive media contingent during his availability at the NFL Scouting Combine. One of those questions centered on the Dolphins, whose ugly locker room culture was laid bare in Ted Wells' independent report. The Patriots were decimated at the tight end position in 2013 due to injuries to Rob Gronkowski and legal problems for Aaron Hernandez. The team could be looking to shore up that suddenly sketchy position. Offensive line, defensive line and cornerback also appear to be areas of need for a team that figures to remain in Super Bowl contention in 2014. Walker was a three-year starter for the Blue Raiders, and while he was not invited to the combine, he did have a solid workout at MTSU's pro day. He appears to be a third-day pick and could appeal to the Patriots, who need depth on the interior. Amaro is considered one of the top three tight ends in the draft. Despite his size, he is a far better receiver than blocker; he had 106 receptions in 2013, his first season as a full-time player. He spent most of his time split wide and rarely played in a set that used a "conventional" tight end. In a teleconference Thursday, NFL Media draft analyst Mike Mayock said he thought Amaro was a possibility when the Patriots pick 29th in the first round -- if they keep the pick, that is. Mayock said Amaro would be an "intriguing" pick and that he could see Amaro "playing that (Aaron) Hernandez" role in the Pats' offense. Taliaferro (6-foot, 229 pounds) is a physical runner who rushed for 1,729 yards and 28 TDs in the FCS ranks as a senior in 2013. He played in a spread offense and was used in a one-back formation. He lacks breakaway speed but is a tough between-the-tackles guy who also has value as a receiver. If the Pats target Taliaferro, he is seen as a third-day guy. They don't have a fifth-round pick but do have two selections in the sixth round. Johnson played left tackle at Vandy, but some analysts think his best pro position is center. Johnson, who started every game in his college career, also can play guard and right tackle. The Pats would seem set at tackle, but adding depth in the interior -- in the person of a guy who potentially could start at guard and/or center -- makes sense for New England. Johnson looks to be a third-day pick. Seferian-Jenkins (6-foot-5½, 262 pounds) is one of the top three tight ends in the draft. Seferian-Jenkins missed the workouts at February's NFL Scouting Combine after a medical test showed he had a stress fracture in his foot; he had surgery and also missed the Huskies' April 2 pro day. He said earlier this month that he expected to be healthy by "April 25 or 26" for a medical re-check. While he won the John Mackey Award as the nation's top tight end in 2013, he was better as a sophomore in 2012 than he was in 2013. He is a good athlete, but his maturity and consistency are questions. At one point, he was seen as a potential first-round selection but now appears to be a second-round guy. It seems unlikely he would be available when the Patriots made their second-round pick at No. 30 (62nd overall). Easley (6-foot-2, 288 pounds) would be an interesting fit with the Patriots. He would've vied for first-team All-SEC honors in 2013, but his season ended after the third game because of a torn ACL in his right knee; he tore his left ACL in 2011. When healthy, Easley -- who is a high-energy guy -- can be disruptive because of his quickness, strength and leverage. While he spent most of his career at tackle, he also played some end at Florida and could fit as a 3-4 end in the Pats' scheme. Easley's injury history makes him a risk; on the other hand, a healthy Easley would have been a potential first-round pick. New England drafts 29th, and could feel Easley's value at that spot overcomes his injury history. Bucannon (6-foot-1, 211 pounds) seemingly is moving up draft boards and would be a good fit for the Patriots, who could use safety help. But would the Patriots take him with the No. 29 pick? That might be a little early. Bucannon, considered the best strong safety in this draft, is a big hitter who had six forced fumbles and 15 interceptions at Washington State, where he was a four-year starter. Bucannon also has met with Indianapolis, which doesn't have a first-round selection and doesn't pick until 27th in the second round, which almost certainly would be too late to get Bucannon. Richburg could be the first center off the board (NFL Media senior analyst Gil Brandt said that Richburg will "be your starting center for the next 10 years"); if he isn't (he could go behind USC's Marcus Martin), he likely will be the second. While taking him in the first round might be a bit of a reach, the Patriots often don't listen to conventional wisdom when they draft. They may think he is worth the No. 29 pick; they also are not shy about making draft-day trades, and Richburg very well could be had early in the second round. Patriots starter center Ryan Wendell turned 28 in March, but he's a journeyman-type talent. Richburg could become a legitimate star at the position. 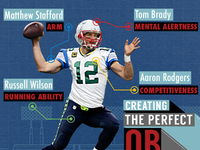 The Patriots do not have a pressing need for a starting quarterback with Tom Brady still entrenched in that position. But the team appears to be doing its due diligence on the top QB prospects in this draft, in an effort to potentially add Brady's eventual successor or just to gain intelligence on some of the passers they might be playing in the coming years. New England hosted McCarron on Wednesday, and if Bill Belichick wants more info on the prospect, he's in a good position to get it, considering his relationship with Nick Saban. The Patriots seemingly have met with every draft-eligible quarterback in this class, and it seems as if they are serious about selecting one in May. If it's Thomas, it almost certainly would be on the third day. Thomas (6-foot-6, 248 pounds) has great measurables and is a big-time athlete (4.61 in the 40 at the combine, with a 35.5-inch vertical jump), but he is far from a polished quarterback and definitely is a project. Then again, perhaps the Pats think he can be converted into a tight end. Mettenberger met with the Patriots on Tuesday, according to NFL Media insider Albert Breer, joining the list of quarterback prospects whom the team has visited or scheduled a visit with: Johnny Manziel, Teddy Bridgewater and Keith Wenning are also on the list. NFL Media analyst Charles Davis believes Mettenberger would be an ideal candidate for the Pats to draft and develop behind Tom Brady before eventually taking over as starter. Gillmore is part of the second-tier group of tight ends and seems likely to be a mid-round pick. Gillmore has prototypical size, is a solid blocker and possesses good hands, but he is not an explosive player. As everyone knows, the Pats make good use of their tight ends and Gillmore could develop into a nice No. 2 tight end behind Rob Gronkowski. Bridgewater in Patriots gear? Given that the former Louisville star quarterback might be a top-five pick in a draft where New England holds the No. 29 overall pick, it's hard to imagine. But it's even harder to imagine the club burning one of 30 allotted chances to host draft prospects on a player it isn't serious about. Manziel will visit with the Patriots, NFL Media insider Ian Rapoport reports. Private workouts and visits with teams are nothing new for top prospects in the 2014 NFL Draft, but it is notable that the Patriots would bring in somebody like Manziel. Bill Belichick and six members of his staff worked out Benjamin at the Florida State campus. NFL Media senior analyst Gil Brandt reported the news. The Patriots are famously tight-lipped about what prospects they regard highly enough to invite to a private workout, so it's especially intriguing when word like this gets out. The Patriots are among the teams set to meet with Williamson in the coming weeks, a good sign for the rising draft hopes of a prospect once considered on the fringe of NFL interest. Based on NFL Media analyst Daniel Jeremiah's experiences from his scouting days, the Patriots won't be too happy that news of their apparent interest in Williamson is available to opposing clubs, much less in the public arena. Norwood wrote in a draft diary for USA TODAY Sports that he has a visit set up with the Patriots. In what is a deep draft for receivers, Norwood figures to be a late-round pick. The Patriots, meanwhile, have a need for a legitimate No. 1 receiver, according to NFL Media analyst Daniel Jeremiah. 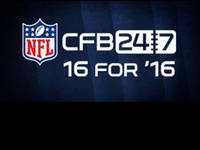 Ford has visits scheduled with the Patriots, as well as the Tampa Bay Buccaneers. If Ford is drafted in the first-round range as expected by draft experts, it's tough to imagine the pass-rushing standout landing with at least one of them in the 2014 NFL Draft. Evans has talked to the Patriots, who have a need at the receiver position. However, Evans also believes that he will be a top-10 draft pick -- recent mock drafts on NFL.com have Evans going anywhere from No. 9 to No. 13. That would require the Patriots -- who own the No. 29 overall pick in the first round -- to make an aggressive move up via a trade. If McCarron has to ride a bench to begin his pro career, he can't think of a better place to do it than New England. After all, having played for a Bill Belichick disciple in Nick Saban, and having won three national championships in five years at the school, the winning ways in Foxborough, Mass., would be far more familiar than, for instance, the weather. The Jets feature a talented defense, but cornerback might be one area to shore up on that unit. Otherwise, the offensive line needs work as could the receiving corps. 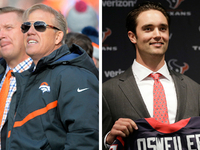 Will the team also jump back into the market for a quarterback in the 2014 draft? 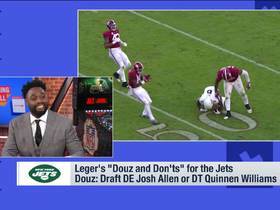 NFL Media Insider Ian Rapoport reported Tuesday that the New York Jets have designs on trading into the top 10 of the draft, with LSU wide receiver Odell Beckham as a potential target. Beckham has been one of the hottest names over the past week leading up to the draft. If Beckham is off the board, though, the team is also keeping tabs on Cooks, per Rapoport. NFL Media Insider Ian Rapoport reported that the Jets are looking to trade into the top 10, and that they are "very hot" on Beckham. Now, it's possible that Beckham will still be available to the Jets if they stay at the pick they currently hold (No. 18 overall), but Rapoport's report suggests the team either has its eye on a much bigger prize or that Beckham's stock is on the rise with a couple days to go before the draft. The Jets signed free-agent quarterback Michael Vick this offseason and also have Geno Smith, who started all 16 games as a rookie last season. Could they be looking to add another quarterback in this draft -- and in the first round? NFL Media insider Ian Rapoport tweeted that he's hearing Jets officials are "keeping in regular contact with QBs slated to go in the first round." In the same tweet, Rapoport wrote the Jets were "maybe serious" about a quarterback with the No. 18 overall pick. The depth of the wide receiver position in the upcoming NFL draft might have some teams content to wait for higher value with a lower pick, but not all. In fact, two of them -- the 49ers and Jets -- are considering a trade-up for the right receiving weapon, according to NFL Media insider Ian Rapoport. Rapoport suggests that Oregon State wide receiver Brandin Cooks and LSU's Odell Beckham, could be the targets of such a move. Savage (6-foot-4, 228 pounds) is one of the more polarizing quarterback prospects; he has good size and a big arm, but he is immobile and his mechanics go AWOL when he feels pressure. 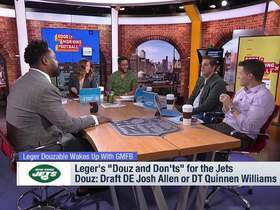 Savage appears to be on the verge of being drafted in the second round; do the Jets really need another quarterback -- and one that could require being drafted in the second round? Well, if the Jets have little faith in Geno Smith, yes, maybe they do need another quarterback. The Jets pick 17th in the second round (49th overall) and that likely will be too late to get Savage. Boyd (6-foot-1, 222 pounds) -- who set an ACC career record with 107 TD passes -- lost some luster as a prospect over the past nine months. His lack of height hurts (he's a bit over 6-0½), and his accuracy can fluctuate. But he stands tough in the pocket, has a nice arm and can make plays with his legs. The Jets famously signed Michael Vick and also have Geno Smith, but finding a third quarterback who potentially (stress the "potentially" part) could become a starter makes sense -- as long as they are not sold on Smith as the long-term answer. Boyd will be a third-day pick. Amaro (6-foot-5, 265 pounds) is considered one of the top three tight ends in the draft. Despite his size, he is a better receiver than blocker; he had 106 receptions in 2013, his first season as a full-time player. He spent most of his time split wide and rarely played in a set that used a "conventional" tight end. He also played in a pass-happy attack unlike any used in the NFL (which is a nice way of saying he's not going to have 106 receptions in an NFL season). He does have good hands and understands how to get open. The Jets need offensive weapons and pick 18th in the first round. That's far too early for Amaro. New York picks 17th in the second round (49th overall) and that would be a worthy spot for Amaro -- but would another team grab him earlier in the second round? The Jets have Michael Vick and Geno Smith at quarterback, but that evidently didn't preclude them from meeting with Garoppolo (6-foot-2, 226 pounds), one of a handful of quarterbacks considered to be in the second tier at the position in this draft. Garoppolo led all of college football with 53 touchdown passes in 2013, when he threw for 5,050 yards. During 2013, he broke school single-season and career records belonging to Tony Romo and Sean Payton. Do the Jets have a legitimate interest? Garoppolo is not worth a first-round pick, but it seems likely he would be gone by the time the Jets make their second-round selection (17th, which is 49th overall). Verrett (5-foot-9½) is the shortest of the top-tier corners available in this draft; there are five CBs in the top tier. The Jets need a cornerback, but will they go in that direction with the No. 18 pick? Wide receiver and tight end (if North Carolina' Eric Ebron is available) are other potential picks. If Verrett goes in the first round, he will be the shortest corner to be a first-rounder in the past six drafts. The Jets are bringing in Michigan State CB Darqueze Dennard later this week; he generally is considered to be higher on most draft boards than Verrett. Powell (5-foot-11, 189 pounds) caught 66 passes for 837 yards and 13 TDs in a pass-happy offense in 2013, and he also is a solid return man. He had a slower-than-expected 4.63 clocking in the 40 and didn't show all that much athleticism at the combine, but he had a much better showing at his pro day. Powell could sneak into the later rounds or be a priority free agent. The Jets, who certainly need some help at wide receiver, have four picks in the sixth round and one in the seventh. Powell's brother, Brandon Williams, played wide receiver at Wisconsin and was a third-round pick by San Francisco in the 2006 draft. Richardson (6-foot, 175 pounds) is considered one of the better deep threats in this draft, and the Jets certainly could use a guy who can stretch the field. Richardson's lack of bulk is an issue, though; in addition, he suffered a torn ACL in 2012. This is a deep draft for receivers, and there doesn't appear to be all that much difference between guys who will be drafted in the second round and those who will go in the fourth and fifth rounds. Would the Jets target Richardson in the second round? They pick 17th in the round (49th overall). Landry (5-foot-11½, 205 pounds) has been overshadowed on the draft trail by teammate Odell Beckham Jr., who seems to be a first-round lock, but Landry had the better college career. Alas, he isn't nearly as fast as Beckham and that hurts him in the draft process. He was clocked in a slower-than-expected 4.77 seconds in the 40 at the combine but improved that to 4.60 and 4.63 at LSU's pro day. Landry, who had 133 catches in his final two seasons at LSU, is a polished receiver with good hands, and despite his lack of speed, he could become a solid complementary receiver in the NFL. He looks to be a third- or fourth-round pick, and the receiver-needy Jets should be interested. Fiedorowicz (6-foot-5½, 265 pounds) is among the second-tier group at tight end, behind the top four at the position. He is a good blocker, and while he was underutilized as a receiver at Iowa (30 catches in 2013, just 91 in his career), he is athletic and has good speed for a guy his size. Fiedorowicz (pronounced feh-DOOR-uh-wits) would be a good fit for the Jets, who need a tight end, especially one with dual-threat ability (catch and block). He looks to be a third-round pick, and the Jets pick 16th in that round. It is no secret the New York Jets remain in need of some help in the pass-catching department. Reports have surfaced about the team having interest in Marqise Lee and Jace Amaro. Now, Manish Mehta of the New York Daily News has reported that, according to a team source, the club is "very intrigued" by the massively-sized Benjamin (6-5, 242 pounds), and that a Benjamin visit to the Jets' facility is pending. The Jets are in definite need of receiving help, but who says they have to turn to a wide receiver to get it? The club is reportedly interested in Amaro, whose prolific receiving skills in college generated 106 receptions last year for 1,352 yards. Roby has visits scheduled with the Bills, Chargers, Jets, Titans and Steelers, NFL Media senior analyst Gil Brandt reported on Twitter. 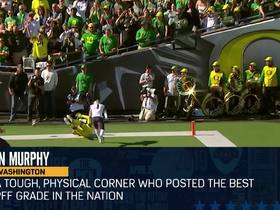 Roby is the fourth-rated cornerback on NFL Media draft analyst Mike Mayock's rankings, and a projected first-round selection based on mock drafts posted on NFL.com. A scout from the Jets -- who could use help at the position -- was among the representatives on hand for North Carolina's pro day, where Ebron worked out and solidified his first-round draft status, according to NFL Media senior analyst Gil Brandt. Evans has scheduled the Jets among his pre-draft visits to NFL clubs, providing yet another hint that the Jets are targeting a wide receiver with their first-round draft choice. If the narrative on Evans' rising draft stock is on target, however, Ryan will have to trade up in order to get the 6-foot-5, 231-pounder. A report from the New York Daily News says high-level personnel from the organization met with Lee before and after his pro day on Wednesday and are strongly considering taking him in the first-round. The 6-foot, 192-pounder could pair nicely with the newly acquired Eric Decker following the departure of Santonio Holmes from the Jets.